A former U.S Ambassador to Nigeria, Robin Sanders, has advised foreign business to take advantage of the conducive business environment in Nigeria and invest more in the nation. She stated that Nigeria had improved from 2010 when she wrote to World Economic Forum On Africa to focus on Nigeria because of its positive growth. “The economic system in Nigeria has improved, especially the banking and capital market system but could be better”. She urged foreign investors to look into the business and growth outlook of Nigeria. 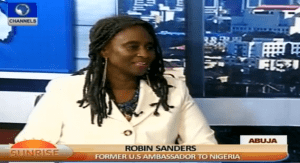 Speaking on Saturday on Channels Television’s Saturday programme, Sunrise, Ambassador Sanders explained that previously, it was difficult for investors to invest in Nigeria due to lack of transparency and corruption, a situation she said had changed, with visible growth in the micro-economic system. The Ambassador, who served from 2007-2010, also stated that there was a lot of negative news coming out of the country which prevented the America government from paying attention to the nation. “The framework of the nation has been looked into and gradually, it is opening up the nation for investments to thrive,” she said. Speaking on the issue of corruption and transparency, she said Nigeria had less issues in transparency than before, stating that Central Bank has been able to work on the banks, reducing the level of negativity on Nigeria when compered with some other countries. She therefore advised that more work should be done in order to eradicated corruption completely.